I'm a BIG fan of homemade clothing, I think everyone knows that! :) My mom used to have handmade clothes when she was growing up and hated them, but the handmade industry has come a lonnnnnng way from my mother's days. My girls squeal with delight any time mom makes them something for them to wear. But what happens when mom doesn't have time? Or isn't too handy with a sewing machine? That's where Eeemee Boutique comes in! 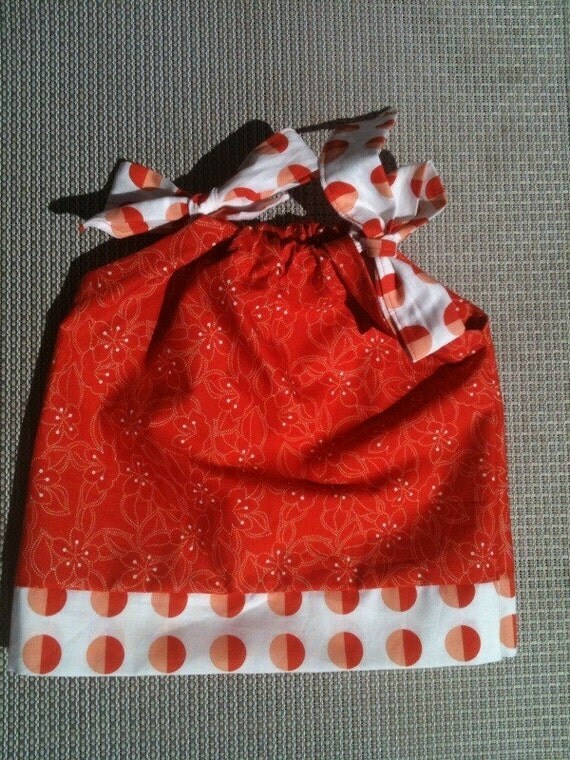 I received the Orange Print Pillowcase Dress and even though it was a size 0-3 months, it would fit 6-9 months as well. I also have my eye on these leg warmers. I really want them! Good: High quality material, fabric straps (which I love! I hate ribbon straps! ), and decent price ($15). Bad: Nothing that I could see! Fan Eeeme on FB (1) - let her know 3 Girls sent you! I added them to my favorites on Etsy. I'm a fan of EeMee on Facebook! commenting for the 3girls giveaway on fb! i am a facebook friend. fan of 3 girls review-left a comment on the page!! Win BIG from Nellie Bug's! !